Snake Oil Salesman - What Does It Mean? 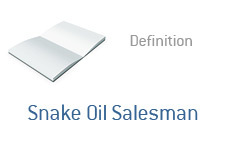 What is a "snake oil salesman"? What is the definition of the term "snake oil salesman"? A "snake oil salesman" is somebody that sells an item that claims to have some miraculous powers. This product is usually accompanied by a tremendous amount of hype. In an attempt to help push their products, the "snake oil salesman" will usually utilize planted accomplices who will claim that the product actually works. Snake oil originated from China. Many people believed that if you rubbed snake oil on your sore joints, then you would gain relief. Snake oil soon made its way to England, where people laughed off the outlandish claims being made by people who were hyping the miraculous powers of the product. If you are involved in the stock market in any way, then you have likely heard the term "snake oil salesman". This term is given to people who are selling products (newsletters, memberships to chat rooms, etc) that are determined to be of a questionable quality. Such products are usually accompanied by outlandish performance claims and over-the-top (and usually phony) testimonials. The term "snake oil salesman" refers to a person that is pushing a product that is deemed to be overhyped at best, and fraudulent at worst.